At the AGM in early December manager Ian McCall had promised at least three new faces before the critical January 2nd derby at Stair Park so it was with some disappointment that over 600 Queens watched the team run out composed of the same players from a week earlier and the already told he was going Brian McColligan on the bench to make up numbers. Both teams played poorly on the day but it was the hosts who grabbed what was widely presumed at the time to be a critical three points. The goal arrived midway through the half as another Lovell error at sweeper presented the ball to Lee Sharp on the edge of the penalty area and he drilled it low into the bottom right corner via the post. It was probably the last error Lovell made in the entire season but it handed a twelve point advantage to the Cleyholers in the race to avoid the playoffs. Indeed it was only thanks to Brechin's defeat at Dingwall that we remained in the playoff spot and not bottom. It was a miserable New Year for Doonhamers as they contemplated the likelihood of returning to the second division. 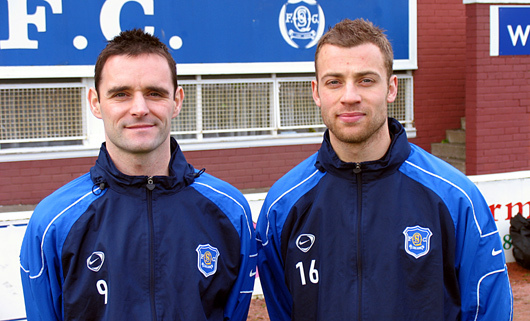 In midweek minor developments saw McCall confirm that he had spent a day talking to Sean O'Connor about his potential return whilst Stephen Payne swapped a relegation battle with Queens to one from the other side of the spectrum, signing for Stranraer. There was some bright news though as it was confirmed that Willie Gibson and Paul Burns had signed the two year extensions to their contracts on offer. Saturday brought relief from the rigours of the league but no fresh opponents as Hamilton arrived at Palmerston for a 3rd round Scottish Cup tie. A 1-1 draw at the end of the day was probably just about fair enough though Queens dominated the final ten minutes as they sought to avoid a replay. Mark McLaughlin had earlier given his side the lead with a powerful header just after half-time only for Derek Lyle to nod home an 80th minute equaliser which meant the two sides would end up meeting in three successive games. Before Accies could return in the league however McCall finally started doing business in the transfer market. A hectic week saw left back Shaun Dillon sign to the end of the season after being released by Kilmarnock, midfielder Ryan McStay and striker Graham Weir arrive on loan from Falkirk and Hearts respectively and another striker, Michael Mullen from the astonishingly named Newmilns Vesuvius, sign an 18 month deal after grabbing a hat-trick in a trial match. Moving out the way though, David McNiven joined up at Scarborough, Brian McColligan moved to Alloa Athletic, Stuart McGrady was released and fringe players Richie Maxwell and Gareth Campbell joined Dalbeattie Star and Cumnock on loan deals. Meantime Scott Robertson joined Burns and Gibson in agreeing a two year contract extension and talks continued with Sean O'Connor. Got all that? 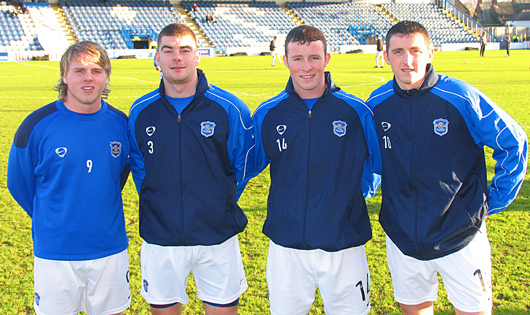 Weir, Dillon, Mullen and McStay Four new players in and all four made their debuts on the Saturday (Mullen from the bench) but it was as you were at full time with another 1-1 draw. This time Paul McLeod yet again opened the scoring for Accies but Stuart Lovell forced home an equaliser. Stranraer's scoreless draw at Brechin meant it was all as you were at the bottom though. Before the midweek cup replay at Hamilton Ian McCall also confirmed publicly that Brian McLaughlin had been told he could leave on a 'free' if he could find himself another club in the window. However, despite talking to one or two the wee man failed to reach any deal and would end up seeing out the season with us. In fact he took his place on the bench for that replay. After two tight draws it was to nobody's great surprise that another one ensued although this time it was a much poorer game with few chances and finished 0-0 on 90 minutes. Unfortunately when extra time commenced it took Accies just 40 seconds to break that deadlock through Rudi Torres and though we huffed and puffed we couldn't get an equaliser. Our hopes certainly weren't helped though by the fact that none of the new players was signed in time to take part. 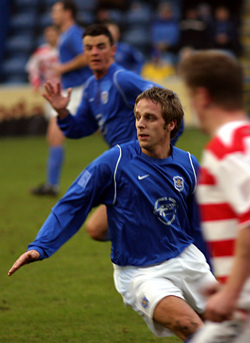 Next up was another trip to high flying Ross County on league business and on the Friday night a late boost to the squad as modern day Queens legend Andy Thomson rejoined the club, more than 10 years after departing to Southend for £250,000, on a deal to the end of the season. It could have been two ex-greats returning but a move for Andy Aitken fell through with Rowan Alexander demanding a fee for him, which we could not afford to pay. Fittingly "Super Andy" scored on his return with a well placed header but sadly it proved to be no more than a late consolation in a comfortable 3-1 loss courtesy of goals from McKinlay, Rankin and, needless to say, Alex Burke. They do say a week is a long time in politics but it can also be a very long time in football and all sorts of things can change in that time. One thing that did change was Rowan Alexander's attitude towards letting Andy Aitken rejoin his first love and to the great pleasure of most Queens fans "Aikers" re-signed for the club before the vital home game with Airdrie United. Incredibly we had now reached January 28th and still only won a single league game all season. That game though was at home to Airdrie United and there was no more obvious possibility of narrowing the still 12 point gap to Stranraer than the visit of the same team. If the comeback was going to happen it had to start right here. And so it proved. It wasn't a great game or a great performance by any means but we did enough. When Graham Weir was upended early on by Airdrie keeper Stephen Robertson, John O'Neill duly despatched the penalty as he usually does. Later on the points were clinched when Paul Burns turned in the rebound after Robertson could only parry Andy Thomson's effort at goal. 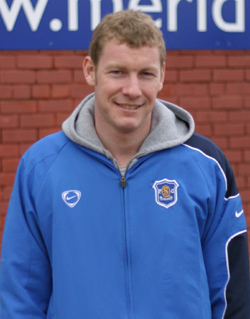 Colin Scott had returned to the fold as number one goalkeeper for this game. With Stranraer going down 2-1 in a tight game at Dundee the gap was down to 9 points. On the Monday after the game Queens finally clinched the signing of Sean O'Connor on a short term deal to the end of the season, though the big man would be going for a small knee operation shortly afterward and wouldn't available until April. Meantime on the Tuesday, a deadline day move for Mark Campbell from St Johnstone failed as he opted for Raith Rovers instead whilst a move for a winger from Kilmarnock who was never named also falls through. Likewise, neither McLaughlin, nor Brian Reid, who by then had also been told he could go, actually left the club and Stuart Hill, who had a deal set up to join Annan Athletic, had a change of heart and remained too.